If a five hour roast lamb can ever really be an impromptu thing. This all started because I recently took delivery of Feasts by Sabina Ghayour, the follow up to her gorgeous Persiana book. One of the first recipes I tried was spiced garlic savoy cabbage ribbons, which was totally lovely. I wanted to make it again and thought it would go very well with a lamb dish I did recently. But a roast shoulder of lamb is way too big for a family of three (plus cheeky dog), so I invited Jenny and her gentleman caller/fiancé, Mr R, to join us. In other news, Jenny and I have an exciting new project – check it out here. Halve the cabbage, remove the core and cut into 2.5cm ribbons. Wash and drain the cabbage, but don’t shake off all the water. Peel the garlic cloves, bash them and thinly slice them. Heat a large frying pan over a medium-high heat, add the spices and dry fry for about a minute, shaking the pan a little. Drizzle in a little olive oil, to coat the base of the pan. Add the garlic and fry for a minute. Add half the cabbage, season and stir. Add the rest of the cabbage, season and add a little oil. Cover the pan with a lid and cook for 3-4 minutes, shaking the pan from time to time, but don’t remove the lid. Stir the cabbage, add the butter, stir again. Check the seasoning, remove from the heat and add the yoghurt. Bliss – I could eat a whole pan of this by myself. Preheat the oven to 140°C, gas mark 1. Place the lamb in a large roasting tin, rub with the oil and season all over including the underside. Cover the whole roasting tin with foil and pop it in the oven. Go about your business for the next three and a half hours. (I think I took the dog for a walk, gave Missy B a lift somewhere, read the paper and tidied something up). After the lamb has cooked for 3 hours 30 minutes, remove the foil and cook, uncovered, on the top shelf for another 45 minutes. Take out the lamb and allow it to rest, loosely covered with foil. Quarter the mushrooms, unless you’ve bought cute little baby ones, in which case leave them whole. Sauté in the butter till they’re well done. Put the lamb on a large serving dish. Pour off and discard any excess fat from the roasting tin, then set over a high heat on the hob and pour in the chicken stock, allowing it to bubble and reduce a little, scraping up any sticky bits from the tin; season. Shred the lamb with 2 forks, then drizzle over the balsamic vinegar and sprinkle with salt. Scatter the mushrooms over the lamb and serve with the roasting juices. Jenny, who doesn’t much care for mushrooms, tucked and found them to be at least acceptable. Mr R, who prefers his vegetables on the simpler end of the scale, had at least two helpings of the cabbage. Result! The lamb is not photogenic, so you’ll just have to take my word – it’s a great recipe. I served it with Dauphinoise potatoes (in case the rest of the meal wasn’t rich enough). I always do these the Richard Olney way, just because it seems to work every time. I’ll post that recipe soon – it’s often on the menu at Battenburg Towers in the winter. 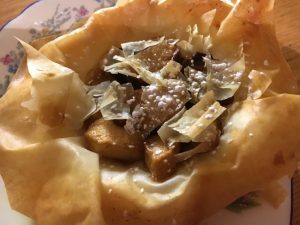 For dessert, I rustled up some little apple filo tarts, using apples from my friend’s garden (sautéd with a little butter, brown sugar, a few sultanas and a squeeze of lemon) and some filo pastry that was at risk of going to waste. I was full from the main course, but still managed to find room for one of these seasonal delights. It was a legendary impromptu lunch! Although I wrinkled my nose up at the inclusion of my most hated vegetable – the mushroom – they definitely added a delicious umami-ness to the dish. The lamb was perfect and as always, your side dishes were a triumph. 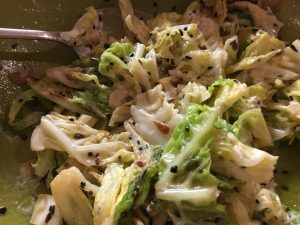 Cabbage has come a long way in my mind since school dinners and is fast becoming my favourite veg, especially when cooked like this – yum, yum, yum! !